A topsy-turvy two weeks for the Sluggers, a 5-2 week at the end of August gave their fans dreams of closing in on the possibility of getting back to a .500 season but it was soon dashed as the first week of September brought them back to earth with a 2-6 disaster. Injuries to two outfielders had rocked Louisville and the one good thing you could say that at least they had passed their 2036 win total and still had 18 games to go. Series wins over New Orleans & Phoenix had given them hope but in the last few days of the month first Abay Omoruyi sprained his elbow and then on the penultimate day Scott Martin fractured his finger. Omoruyi will be out till late September and Martin is gone for the season. It could have been redemption for fallen hero Vince Osborn, but he just couldn’t grasp it. Restored to right field he proceeded to go 4-20 with just one extra-base hit & one walk. Maximo Quezada who had been in and out all season, promising to deliver but never quite managing it, headed for centre field again; while his 9-28 wasn’t outstanding it at least raised his season average to a semi-respectable .247 and he also sent four balls over the fences driving in seven runs while scoring six runs. So, all of that means Quezada will keep his centre field role, probably for the final 18 games and Osborn can ride the pines thinking of a 2038 riding the bus in Triple-A Missouri. 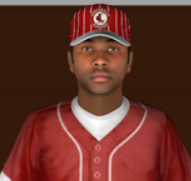 Meanwhile Pedro Saldana will return to right field where he has been most of 2037 and Calvin Clohessy will attempt to finish the year in left, with a rare starting role for the Sluggers super-utility man. Roster expansion has if nothing else highlighted the lack of anything near BBA batting quality in the top minors, just four batters have been brought up from Missouri and only Doug Glover Jr would be considered as anything above a bench-sitter, except he is third on the depth chart at 3B behind Jaime Ramirez & Sean McGuire. The fans can I suppose celebrate sophomore DH Jose Vazquez reaching a career high in homers with 38 and his first ever 100 RBI season, at only 23-yrs-old he could possibly look forward to setting a few Louisville records. Ramirez has successfully reached his third straight 50+ stolen base season and is now seven short of a second straight 60+ season. Joey O’Brien has been a success in his first full BBA season as has Ricardo Tavares, they could be a solid middle-infield duo for years to come. But, lets not kid ourselves, a Louisville ‘solid’ player is everyone else’s replacement level player. A run of seven starts with a 0-2 record has left Carlos Guzman marooned on nine wins while Pepe Jaramillo has gone 3-1 in his last four starts to become the first Louisville pitcher to reach double figure wins in 2037, OK, his record is 10-12 but ten wins is 10 wins? Kevin Morales is soldering along as the only rotation member with a winning record (8-5) as the Sluggers post another poor year on the mound. The BBA’s #16 prospect, LHP Augusto Sanchez, has now made his BBA debut with a start September 2nd in Mexico City. That didn’t go too well as he collected the loss giving up six runs in five innings but in his second start he came home to play Atlantic City, surrendering only three runs in 7.2 innings, to collect his first BBA win. Lando Klomp became the latest in the series of rocky players at the back end of the Sluggers bullpen with two rough outings against the Gamblers, in two consecutive outings he gave up a total of seven runs and three homers while only getting one out in each appearance and adding one more blown save to Louisville’s growing 2037 total. Louisville can at least hope for the possibility of a .500 week next week as they travel first to JL Southeast leaders Jacksonville before heading home to face bottom of the FL Pacific division Valencia who have lost 90 games so far. The next week will finish off the Sluggers home season with series against Las Vegas and Huntsville before they head off for a final six-game road trip. Heading into fellow Southeast strugglers New Orleans & Nashville gives Louisville the chance maybe to climb off the foot of the table and perhaps reach as high as 70 or 72 wins for the season.